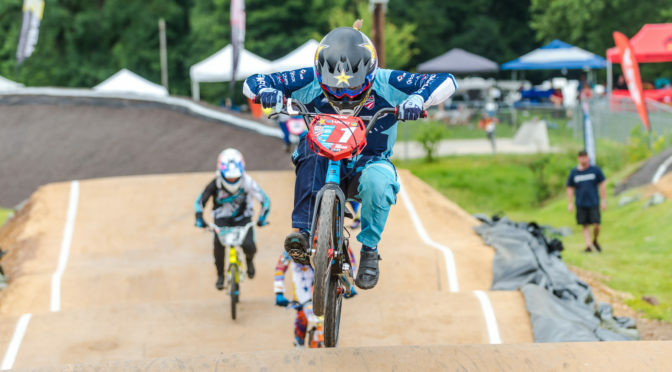 Trilogy Park BMX in Pottstown, PA is the hometown track of Payton P-Nut Ridenour and also the latest stop on the USA BMX national schedule – the Stars and Stripes Nationals, July 6-8, 2018. The weather leading up to the event was hay, hot, and humid with temperatures in the high 90s. Some downpours on Friday morning created a 3-hour delay but gave way to some much cooler temps and beautiful blue skies for perfect racing conditions. Thanks to the quick acting Trilogy crew for covering and keeping the super smooth track in prime shape. Payton was featured on the event shirts, hats and stickers and could be seen giving out autographs and taking pictures with friends, family and fans. As for racing, Payton had the track dialed and dominated the 15-16 girls class by taking the win all 3 days. It was another awesome race weekend in the books and looking forward to what the rest of the season has to offer.